Shawn P. Buckley, 31, of Waterloo, was arrested on a warrant and for resisting arrest and speeding on Admiral Parkway at Wedgewood Drive. Manuel L. Gusman, 38, of Columbia, was arrested on a warrant at 127 W. Monroe Street. Robert B. Klunk, 32, of Columbia, was arrested for DUI, possession of cannabis, possession of drug paraphernalia, driving in the wrong lane and failure to yield to an emergency vehicle at 140 Lakewood Drive. Jason C. Smith was arrested on a warrant on Marney Lane at Covington Drive. 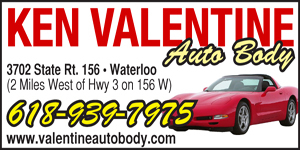 Robert C. Greenhill of Waterloo was cited for leaving the scene of an accident and driving too fast for conditions following a crash on Kopp Road. Gregory A. Phillips of Waterloo complained of minor injuries but refused medical transport after the 2013 Harley-Davidson he was driving westbound on Hanover Road east of Dennison Drive swerved to avoid an oncoming vehicle, skidded into a ditch and overturned around 3 p.m.
A possible assault reported outside of Route 3 Bar & Grill is under investigation. A man allegedly pulled a knife on another subject, with no injuries reported. Amanda M. Townsend of Belleville and Dallas Rivers of Cahokia were each arrested on warrants. James Cody Voss of Waterloo was arrested on a St. Clair County warrant on South Ronnie Drive. The reported theft of two “Bridge Closed” signs and cables on L Road between Hecker and Red Bud is under investigation. A woman reported the theft of three or four ripe tomatoes from her garden on Jason Drive off Route 156 west of Waterloo around 1:45 p.m. The alleged suspect was driving a white pickup truck with a king cab and camper shell. 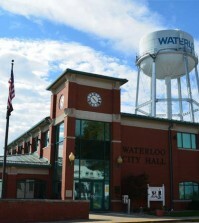 Ryan Horn, 25, of Waterloo, was charged with felony theft for an incident that occurred June 26, during which a saw, DVD player and laptop computer were allegedly stolen. 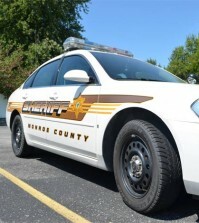 Dustin E. Schlemmer, 24, and Jessica R. Wilson, 25, both of Waterloo, were each charged with felony unlawful delivery of a controlled substance (heroin). Columbia fire and EMS responded along with Dupo police to a motorcycle crash on Imbs Station Road around 5:30 p.m. A male was transported to an area hospital for treatment of injuries. No other information was available. Robert H. Anderson, 18, of Hecker, was arrested for possession of cannabis and possession of drug paraphernalia on Williamsburg Lane at Park Street. Christian Gerfen, 23, of Freeburg, was arrested for retail theft at Walmart. Ronald Hamlin, 56, of Waterloo, was arrested for DUI, illegal transportation of alcohol, driving while suspended and failure to reduce speed to avoid an accident in the 200 block of North Main Street during which multiple parked cars were struck.